Teen pregnancy rates and births among African American and Latino/Hispanic youth aged 15-19 are more than twice as high as the rates in non-Hispanic white teens. Behaviors that lead to unintended pregnancy are heavily influenced by underlying socioeconomic conditions (poverty, discrimination, and lack of opportunities) as well as cultural norms (in terms of gender, sexuality, health, sexual orientation and illness). Recent literature on racial disparities in unintended pregnancy and HIV and effective teen pregnancy and HIV prevention programs underscores the importance of cultural sensitivity, cultural relevance, and cultural competence in the delivery of services and care. 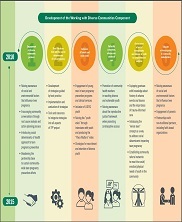 JSI provided training and technical assistance to nine state and community-based youth-serving organizations and partners, implementing the “Working with Diverse Communities” component of the federally funded initiative, Teenage Pregnancy Prevention: Integrating Services, Programs, and Strategies Through Community-wide Initiatives. As part of the President's Teen Pregnancy Prevention Initiative (TPPI), CDC partnered with the federal Office of the Assistant Secretary for Health (OASH) to reduce teenage pregnancy and address disparities in teen pregnancy and birth rates. The purpose of this program was to demonstrate the effectiveness of innovative, multi-component, community-wide initiatives in reducing rates of teen pregnancy and births in communities with the highest rates, with a focus on reaching African American and Latino/Hispanic youth aged 15–19. JSI assisted these grantees to raise awareness among community partners about the social determinants that impact teen pregnancy and how they can create feasible strategies to address them. 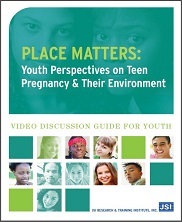 This context, paired with evidence-based interventions that taught youth about pregnancy prevention and linked them to community-based clinical services, offered a holistic approach that actively engaged communities in a process that supported and promoted positive youth development and healthy relationships and lifestyles. identify and educate a diverse group of community stakeholders on policies that impact teen pregnancy prevention and related social determinants. JSI technical assistance and training (TA/T) services included on-site technical assistance, content-specific training, and technical support, and institutes that bring together grantees, organizations with similar missions and needs as well as content area experts. 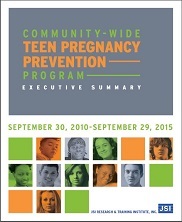 In addition, JSI provided a quarterly newsletter for grantees and developed a website highlighting resources and tools for delivering teen pregnancy prevention services to diverse communities, showcase what different grantees are doing to provide culturally competent teen pregnancy prevention services and will serve as a dissemination point for resources. JSI was honored to be one of five national organizations selected to provide training and technical assistance to all funded organizations within this initiative.